Last week was the Hack.lu Final CTF. 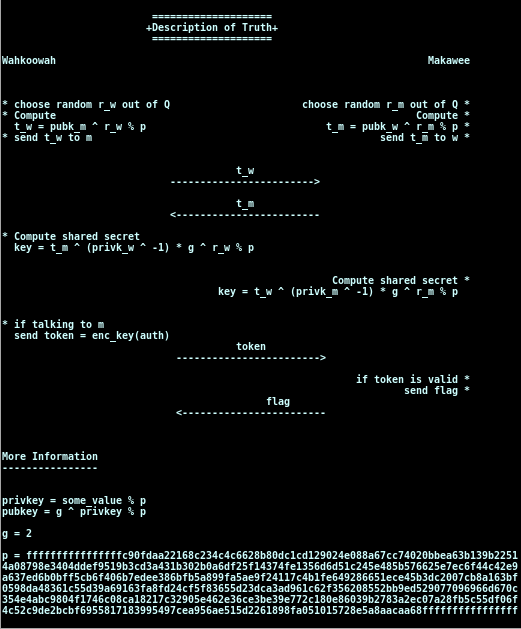 In this post I discuss one of my favorite crypto problems in that CTF: the "Peace Pipe". After a long day, you sit around a campfire in the wild wild web with a few Sioux you met today. To celebrate friendship one of them takes out his wooden peace pipe and minutes later everyone seems to be pretty dizzy. You remember that their war chief "Makawee" started something to say about a secret tipi filled with fire-water (the good stuff). But when he noticed your interest he immediately stopped talking. You recall that "Makawee" spoke with "Wahkoowah" about that issue, but it ended with a fight. Since then Makawee wouldnt talk to Wahkoowah anymore. While they argued "Chapawee" wrote something down. Maybe you can exploit their dizzyness to find out the location of the tipi. It was obvious that this game was about fooling our fellow stoned native-Americans. * namestar [starname] [key_of_truth]   Adds a public key to a user. Choosing the options namestar we are able to pick a (new) name to add a key. Picking the option showstar we are able to see the key for some name (for example, for Wahkoowar, Makawee, or any new name we had added before). How a message (t) is created with someone's public key, a random rational number (r_w), and a given modulo number (p). The only unknown here is r_w, which is a rational number (Q). This mean that any plans to brute force the messages wouldn't work (however, if r_w was an integer, this task could be achieved). Everyone has a private key that is modulo p. We never learn anything about anyone's private keys. We just know that they could be of the order of p (which is a really large number, ~1E2048). Notice that we can move the multiplications' modulo operation to the end, due to this propriety. In conclusion, all we need to do is to convince Wahkoowah that we are Makawee (by telling him we are Makawee, so he can use his public key, and by sending him a correct t_m). If this works, he will give us a token. Then, if we send this token to Makawee, we get our flag. Oh its you, Im so sorry. Can we talk now? We continue our conversation, right? noone ... do I know you? Mmmm, we need to make Makawee use Wankoowah's key without him knowing it! mrwhite ... do I know you? Every key in this problem is given by mudulus p. This means that we have infinite values that map to the same original key. My first attempt was to multiply the original key by p, so that, when it receives the modulo operation, it circles once more returning to the original value. It didn't work. The reason is that p is too large. When multiplied by the key (that is large itself) we loose precision and we don't go back to the original value. We need to keep the values in the same scale! We notice that the public key is exponentiated by r_m. It means that, if r_m is an even number, two values of the public key are mapped to the same value of the final message: +pubk and -pubk. That's all we need! We are going to disguise Makawee by creating a star with the negative value of Wahkoowah's key. Automatizing the Process and getting the Flag! All right, now we know how to make Wahkoowah and Makawee talk and how to get t_m and t_w. We are ready to generate the token that will lead us to the flag.
""" Get the magic message from some user to calculate rm """
That's it! Hack all the things!